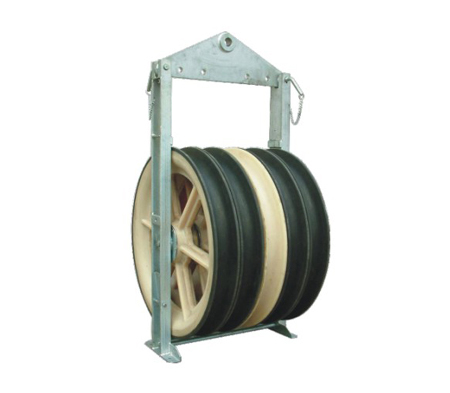 822MM stringing blocks are used for stringing medium size conductor (31-35 mm) in overhead transmission line construction. We designed and manufactured 822MM blocks for single, 2 bundled, 4 bundled, 6 bundled, 8 bundled conductors stringing. The sheave is made of high strength MC nylon, can be lined with neoprene. It is normally used for conductor from 31-35 mm. The sheave size: (outer dia. X inner dia. X width: Φ822 x Φ710 x 110 mm. The item 10148 can be dissembled for easy transportation, The central sheave size isΦ520 x Φ400 x 120 mm.